A man and a child accidentally bump into each other at a street corner – a normal everyday incident. But when the child falls down, the man deliberately tramples over her, ignoring her screams of pain. When he is stopped by passers-by, he shows no remorse. This is the reader’s first introduction to Mr Hyde, a man who has no obvious deformity but gives off an air so repellent that strangers passing him in the street shudder without knowing why. 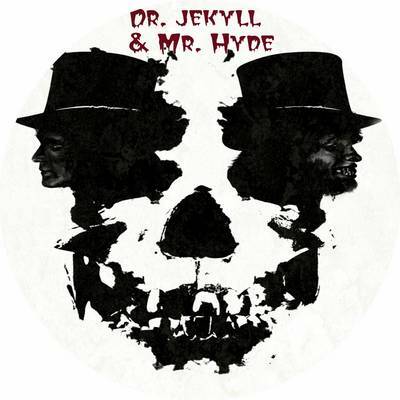 But this man has some kind of hold over the eminently respectable and well-known scientist, Dr Jekyll, who not only pays compensation for Hyde’s actions, but also gives him the run of his own house, and has made out his will in Hyde’s favour, leaving him everything should Jekyll die… or disappear. In my review of the book, I mentioned a few things that made the story work so well, and even as I did, I could see that some of them wouldn’t work at all well on film. So I anticipated that the basic story would be changed, and decided that I would be looking to see how well the films stuck to the spirit rather than the actual plot. London fog is a major character in the book, beautifully described and working both to give a scary atmosphere and as a metaphor for the darkness hidden within each human soul. I was disappointed to see that neither film made real use of this. Each shows the fog at one point and March makes a mention of it in the 1932 version, but it doesn’t ever get used to obscure acts of wickedness or to show London as a place where viciousness lives side by side with respectability. Interestingly, when I read London Fog recently, Corton mentioned that the fog created for use in films used to make cast and crew feel ill, so I guess directors probably chose to use it sparingly. But I missed it. In fact, neither film gave a particularly atmospheric picture of London at all. I suspect they were both made mainly in the studio, and anachronisms abound – in dress, speech, manners. The sets are kept limited, for cost reasons presumably, so there is little prowling around dark alleyways. The Tracy film does better here, showing some contrast between the ultra respectable areas and the seamier side of life. But overall the films both rely more on dialogue and acting than on creating visual atmosphere. 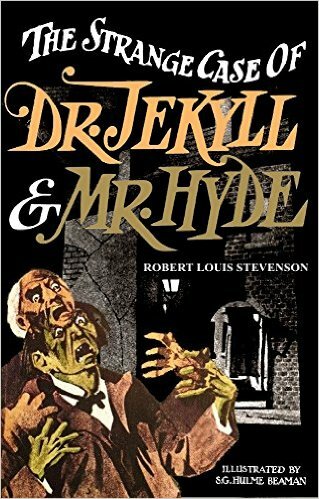 The book gives very little indication of what Mr Hyde’s vices actually consist of and this works perfectly in written form, leaving the reader to her/his own imagination. Clearly it would never work in a film though. 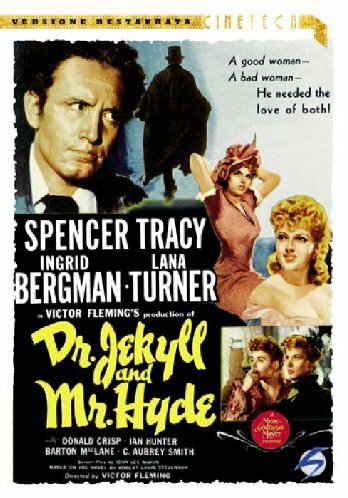 The 1941 film is obviously based on the 1932 version, so both have gone for the same addition to the story line – the introduction of two beautiful women, one the fiancée of Dr Jekyll, the other a prostitute (1932) or good-time girl (1941) who becomes Hyde’s unwilling mistress and major victim. In both cases this works brilliantly as a way to show the contrast between his good and evil sides and his struggle once evil begins to take him over. The 1932 film has two lovely actresses who both turn in strong performances – Rose Hobart as Muriel, the fiancée, and Miriam Hopkins as Ivy the prostitute. Ivy’s transition from extremely saucy temptress to terrified victim is excellent, and though the physical violence mostly happens off-screen, the psychological torture Hyde uses on her is chillingly horrific. The 1942 film has Lana Turner as fiancée Bea, and Ingrid Bergman as Ivy. 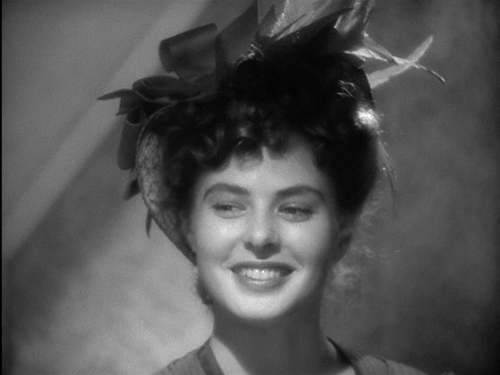 Now, I shall admit bias here – I have adored Ingrid Bergman my entire life. In fact, as a child I wanted to be her when I grew up. She is stunningly gorgeous and a great actress, especially in these vulnerable, woman as victim roles. Her portrayal of flirty, tempting Ivy at the beginning is charming and her terror once Hyde has her under his brutal control is superb. So… I was prepared to overlook her extremely dodgy attempt at a kind of Cockney accent! At least she made an attempt, which is more than could really be said for either Lana or Spencer, who both sound cheerfully American throughout. As far as the women go, acting honours come out about even – fine performances all round – with the 1932 edging it in terms of authenticity of accent, but Bergman’s performance just outshining Hopkins’ for me. The men, Fredric March and Spencer Tracy, are just about equally good in my opinion – again I have a huge soft spot for Spencer Tracy, but I could see why many people rate March’s performance as the better of the two. Which brings me neatly to the crux of the matter – it is in the character of Jekyll/Hyde that the two films finally diverge, making one an adaptation faithful to the spirit of the book, and the other a kind of schlock horror – excellent, but wrong. The book makes it clear that Jekyll has always had vices but now finds it difficult to indulge them due to his increasing fame. So he is never a truly good man – he is a weak man, whose evil side comes to dominate him more and more. The March film gets this so wrong, portraying Jekyll as some kind of angel, caring for the poor and needy out of goodness of heart. Not so the Tracy version, which has Jekyll single-mindedly pursuing his objectives, carrying out experiments on animals, and people if he can get the chance, and not needing much temptation from Bergman to stray from the path of righteousness. And again, the book says specifically that Hyde suffers from no obvious physical deformity – his evil is in his nature, not his physical being. The Tracy film is spot on – though his appearance changes, he remains a man – coarsened, perhaps, but not head-turningly grotesque. March turns into the ape-man! He does it brilliantly, but still – it’s ridiculous! By the end he’s leaping about up and down shelves like some kind of manic chimpanzee! His body language is that of an animal – all twitches and sniffs. Tracy is always a fully human man – much more chilling when he turns to evil and, more importantly, true to Stevenson’s creation. So, both films are very enjoyable and I had huge fun immersing myself in the story again and again. But in terms of Film of the Book – the 1941 version wins hands down. Take a bow, Mr Fleming and Mr Tracy! Great adaptation! What a thorough, well-written review, FictionFan! One of the things it shows is that a film doesn’t have to be identical to the book from which it’s adapted in order to be a fine film. And for a cranky, insufferable dedicated purist like me, that’s quite an admission. I will say, though, that it’s a pity they didn’t do any filming in London, because the fog and the outdoor atmosphere play such a role in the story. Ah, well… Very glad you enjoyed the film. Thanks, Margot! 🙂 Yes, I get annoyed when they mess with things too, but in this one I could see how impossible it would have been to film it exactly as its written, so felt that the beautiful woman motif was a reasonable addition! I was disappointed about the lack of fog – both films managed to get over Hyde’s evilness anyway, but without the atmosphere that Stevenson achieved. However, both good films that have stood the test of time well! I’m a huge Ingrid fan too, but I’ve never seen this film – I will try & find it online. Thanks for making me aware of it – can’t wait to hear the cockney accent! She just does vulnerable so well! And flirty! I found it on Amazon Instant Video, if that helps. And her accent is very sweet even if it’s not exactly consistent! Great review. I saw both films as a child, but neither made the impression on me that the book did and still does, probably because “nameless vice” are so much scarier than the other kind! It’s been far too long since I saw both films, so I should revisit them, especially since I too am a big Ingrid Bergman fan. One version which I found genuinely scary was James Nesbitt in ‘Jekyll’, a TV series from a few years back – a sort of spin-off set in the modern day (not to be confused with the current TV series, which was a bit too fantastical). What a great idea for a review! You have book vs. film, and two films squaring off against each other. Very clever! I think my allegiance lies with the earlier film version – just because I’m a real Fredric March fan – but you’ve prompted me to actually read the book. I’ve never even read the original novel, but I’m putting it on hold at the library as we speak (type). Thank you! 🙂 I think if I hadn’t been comparing to the book, I’d have found it really hard to choose between the films – I loved both Miriam Hopkins’ and Fredric March’s performances, and each film tried out some innovative techniques for the time. Great fun watching them together – and I do hope you enjoy the book! Thanks to you and Christina for hosting it – I’m having loads of fun reading all the other posts, and my to-be-watched list is getting nearly as out of hand as my to-be-read list always is! I’m going to have to revisit these! 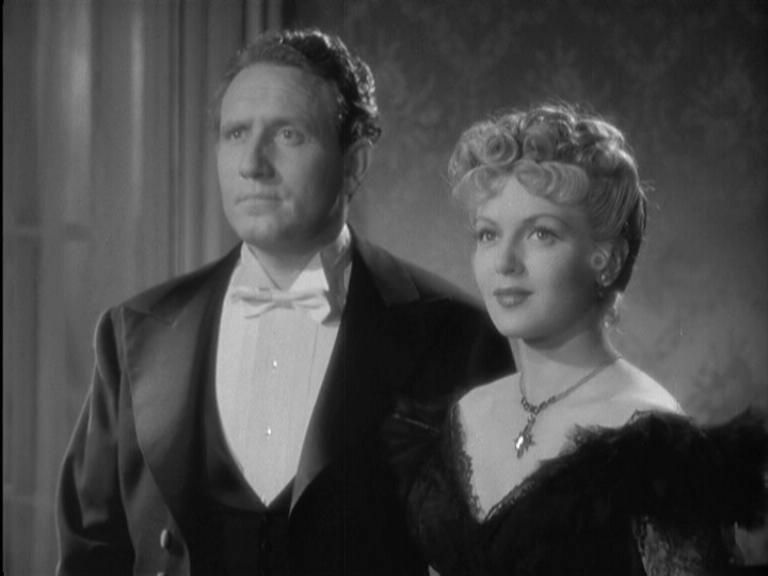 Initially, I was not as impressed with Spencer Tracy, but you raise a great point about how his appearance is much truer to the book. Definitely going to give these a second look. 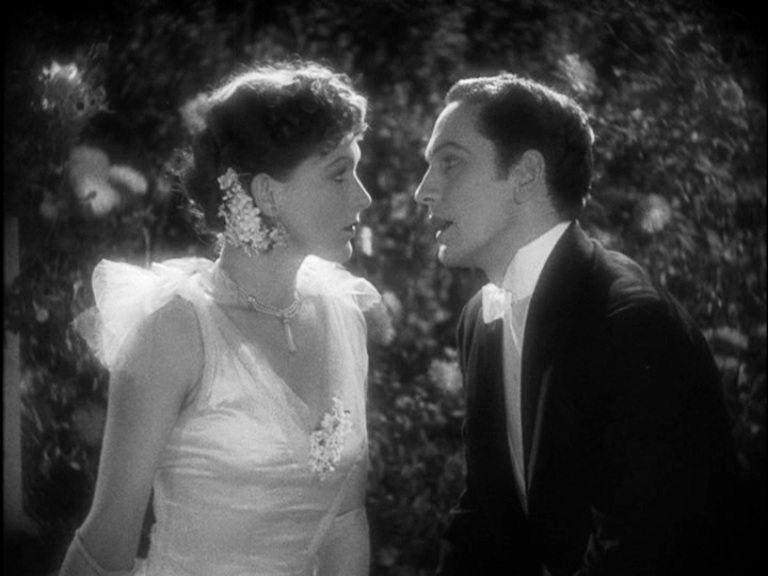 One moment I remember really liking in the original 1941 version was when Bergman looks back and for a moment believes that she recognizes Hyde in Jekyll. Very chilling! 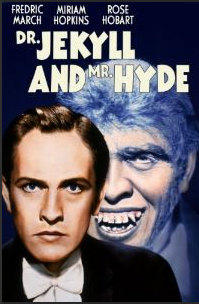 I so enjoyed this Jekyll and Hyde face-off and am glad you could participate in the blogathon! Tracy’s performance does look a bit understated in comparison to March’s but I did think it was much truer to the book – part of the scare factor in the book is exactly that Hyde is still human. I must say I thought both Bergman and Hopkins were great – they both handled the change from flirty to terrified brilliantly. And though the other two women didn’t have such meaty roles they were excellent too. I was surprised, not having watched either of them for decades, at how well they’ve stood the test of time. Great stuff! I know! But I must admit the inclusion of the women actually worked in this case, and the performances were all great in different ways. A week of Jekyll and Hyde… super fun! I’m pretty sure that as a kid I saw part of one of these films on TV, but didn’t see all of it. I’ll have to rent the Tracy one through Netflix or the library. I’m sure I saw them both but didn’t remember much about them. They’re both great fun though – hope you enjoy! Oh no no no! I call for a retrial! This is obviously set-up! I know! The film must have cheated!! Weeeeellllll….maybe a bit? Umm…she was the one that always plays alongside Humphrey Bogart, I think…. Yes, yes, that’s her!! You’re good with names, I say. I have actually watched this film, although quite some years ago – so that’s a start! Loved your review and probably even agree that the film was better in this instance. I love old horror films before they got too gory – they leave all the worst bits up to your imagination. And anything with Spencer Tracy in it has an unfair advantage as far as I’m concerned… and Ingrid! I must have seen bits and pieces of this, but I can’t remember (knowing me, I probably hid my eyes and fled the room before the scary parts came on screen, ha!) Well done, FF — thanks for showing me what I missed! I vaguely remember watching the March version as a child. I was terrified! I think I need to see the Spency Tracy version, instead. Yes, I think as an adult my assessment would be quite different.